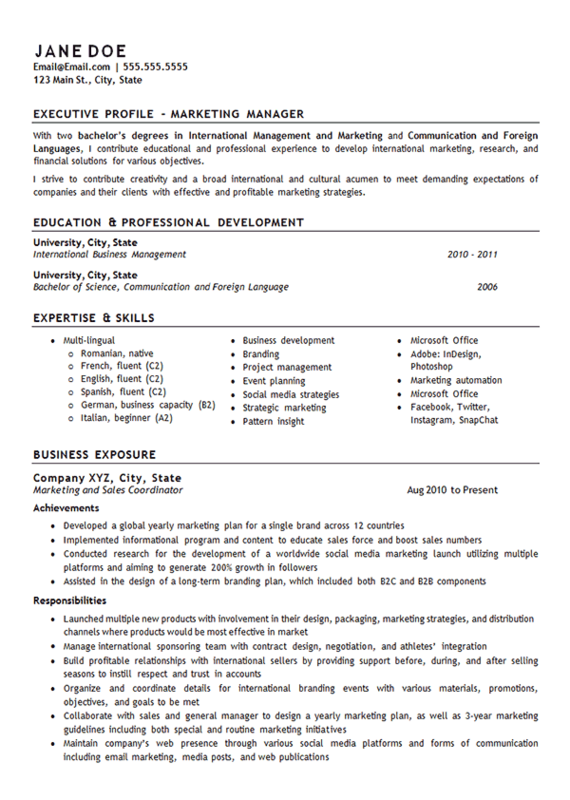 This job seeker was a specialist in language, so the marketing manager resume example was written to highlight international business experience. In order to best represent this professional, this resume included a snapshot of the most recent position only. It’s the only position listed and includes both achievements and daily responsibilities necessary to do the job successfully. More important than the experience section was the skills section, which listed the many qualifications that made this candidate an asset to a company. While this marketing professional was extremely successful at their job, all of these components, including her profile and education sections, painted a picture of the type of employee they could be. It is integral to show a well-rounded nature on a resume so employers can take a look into the heart of the candidate, as opposed to just seeing facts on a page. Launched multiple new products with involvement in their design, packaging, marketing strategies and distribution channels where products would be most effective in market. Manage international sponsoring team with contract design, negotiation and athletes’ integration. Build profitable relationships with international sellers by providing support before, during and after selling seasons to instill respect and trust in accounts. Organize and coordinate details for international branding events with various materials, promotions, objectives and goals to be met. Maintain company’s web presence through various social media platforms and forms of communication including email marketing, media posts and web publications.